neck construction-has resulted in the lightest, strongest and most robust sounding guitars available on the market. So, it should come as no surprise that Blackbird guitars has done it again, this time creating a practically carbon neutral engineering wonder-Clara. Partnering with Lingrove, Clara is the world’s first eco ukulele. It is made with the same patented construction that Blackbird is known for, but instead of being made with the standard carbon fiber kevlar blend, Clara is made from a renewable natural composite known as Ekoa. Appropriately named, Ekoa is a renewable plant based material that replaces the need for the use of endangered Koa trees typically used to make ukuleles. According to Blackbird Guitars, “Like all composite materials, Ekoa is made up of fiber reinforcement fabric in resin matrix, but one that is worker and planet-friendly. 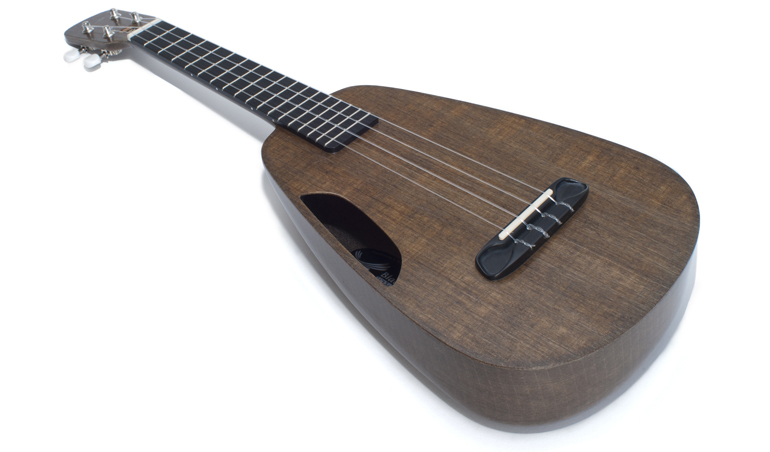 The plant-based fabrics and biobased resins have a beautiful designer material quality, which does not always require finishing along with distinct performance advantages over other composites.” Ekoa enables the Clara ukulele to carry the full bodied sound of vintage wood, without the weight and fragility that often comes accompanied with vintage wood instruments. This revolutionary material is lighter than its carbon fiber predecessors, so it makes it even more ideal for traveling . In addition to its eco-friendly design, Ekoa is also much more durable and stable than vintage wood. This means that the material will not crack under temperature differences or exposure to humidity. So, if you are looking for an instrument that needs to be babied, Clara is not for you. However, if you are looking for a ukulele that offers big sound in a little body, a greater dynamic range and frequency response all wrapped up in a beautiful sustainable package then Clara is your girl. In an interview with one of Blackbird’s Founders, Joe Luttwak, TFOT learned that the proprietary Ekoa material is poised to revolutionize the making of a variety of “wood based” designs from other instruments to heirloom products. As the world seeks alternative methods for producing a more sustainable future, we expect big contributions to be made from Ekoa. Time will tell. More information on Clara and Blackbird Guitars is available on their website here.